A couple of weeks ago, one of my Facebook friends posted a photo of her fireplace and mantle decorated for Christmas. I absolutely loved the wreath that she had hung above her mantle. After discovering she had made it herself, I told her that I may steal the idea and create something similar. She said, “Steal away.” So, here we are. Shortly after I saw her photo, I went to Michael’s to round up the needed supplies and got to work. I’m really thrilled with how this turned out, and it was seriously so easy to make. 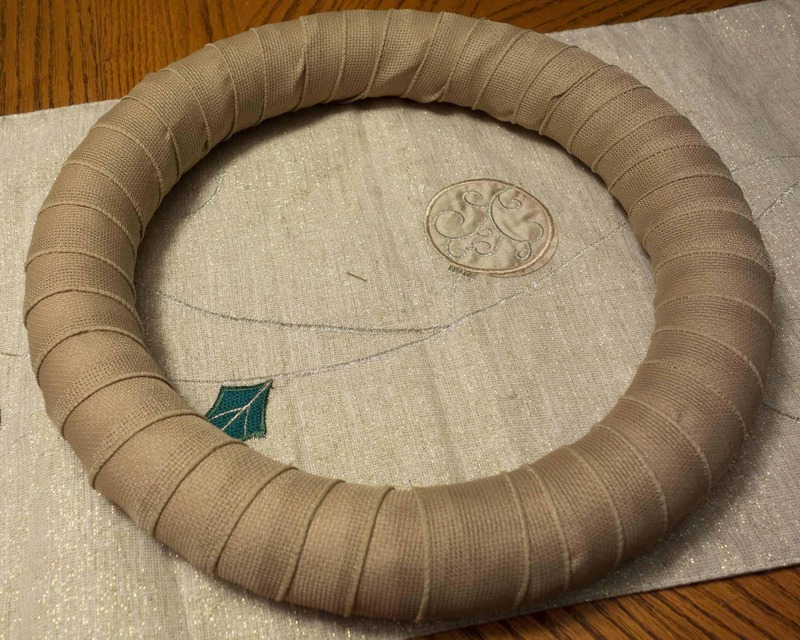 First, hot glue the end of the burlap ribbon to the foam wreath. 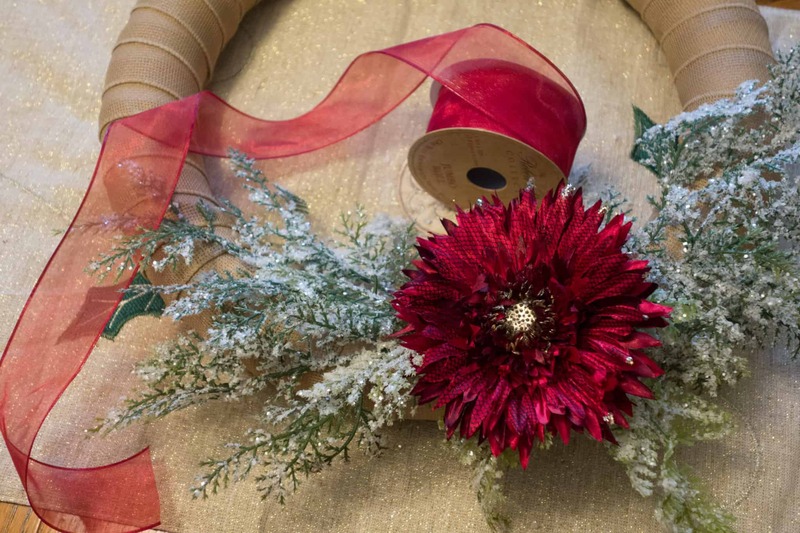 Once the end is secured, start wrapping the ribbon around the wreath. 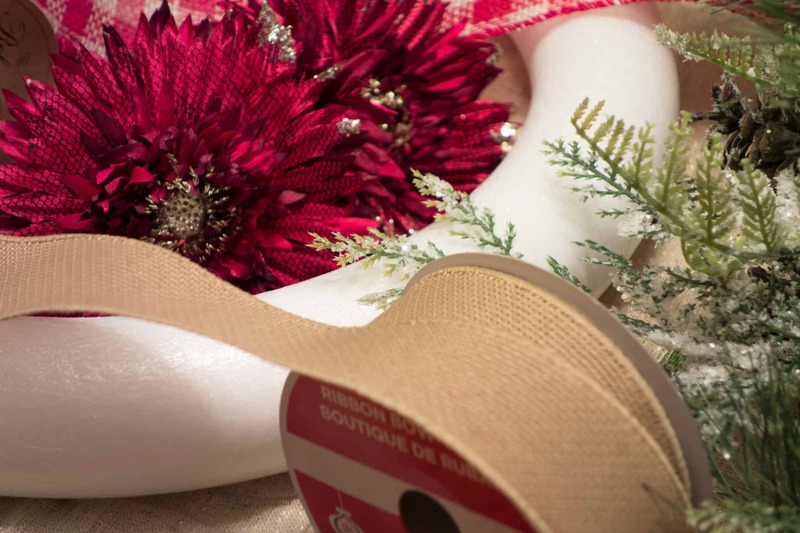 I purposely chose a ribbon that wasn’t too wide because I wanted the ribbon to lay down flush against the wreath. Even with a narrower ribbon, I still had a bit of bunching. I was able to cover quite a bit of this up with the greenery though, so don’t worry if it’s not perfect. 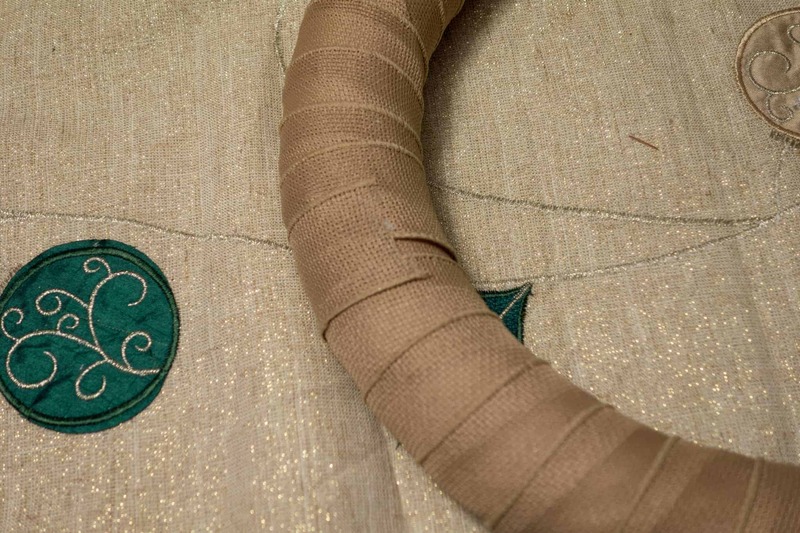 I tried to wrap the ribbon pretty tightly, and to keep the spacing as even as possible throughout. 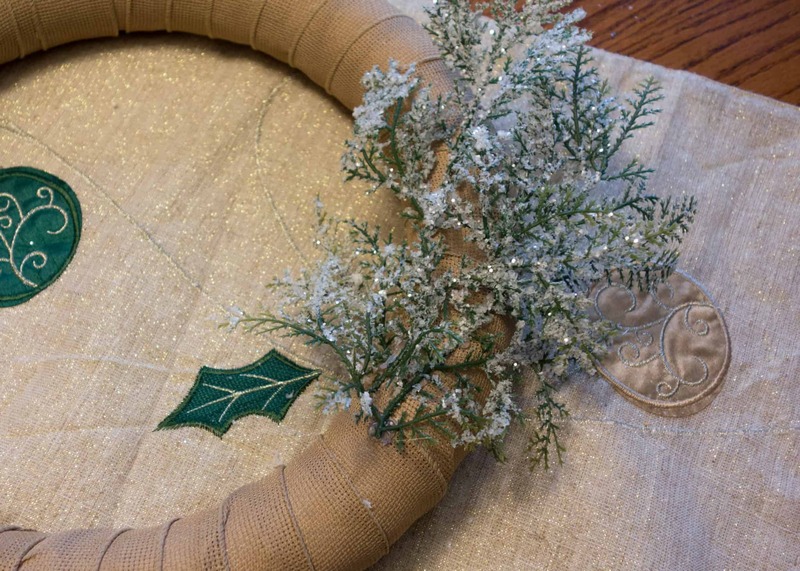 When the wreath was completely covered with the burlap, I simply glued the other end down. Then, I took apart the greenery that I had purchased. I bought a little greenery bush that contained a number of different textures and branches. 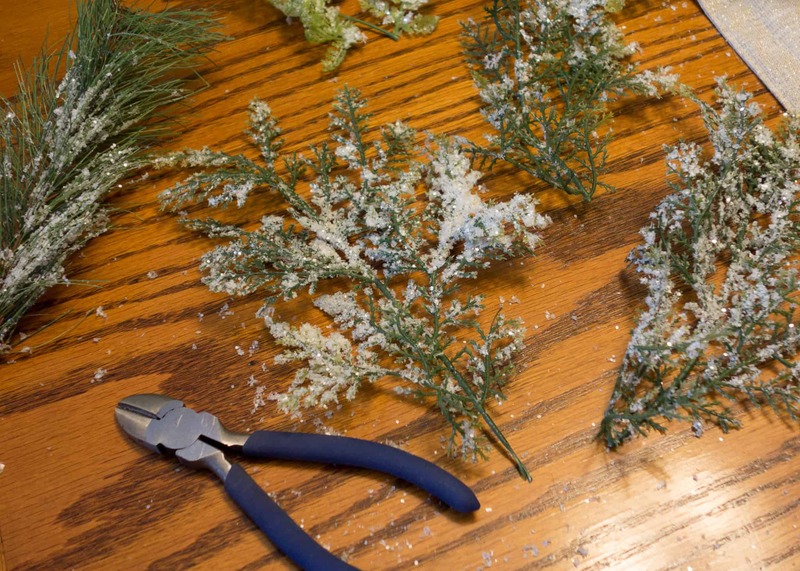 After I had the wreath wrapped in burlap, I started clipping individual branches off of the mini-bush. 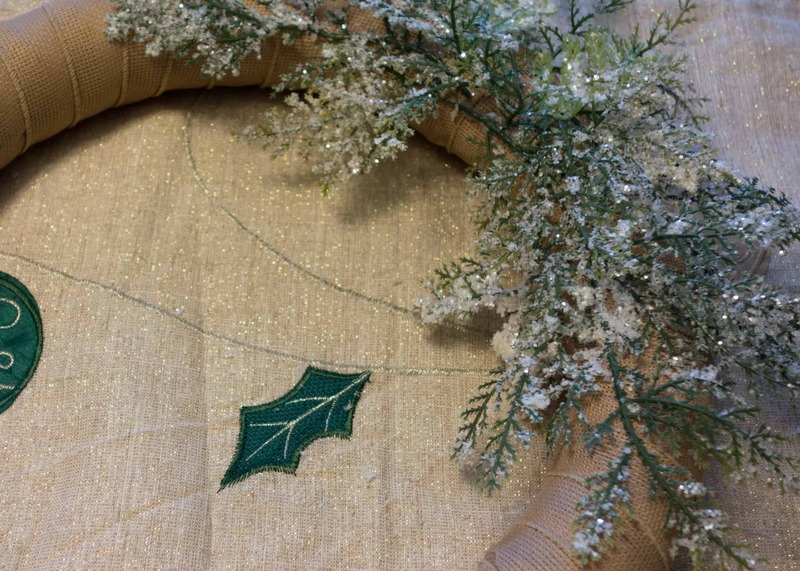 My original intention was to use all of the different branches to create a full wreath with lots of texture. 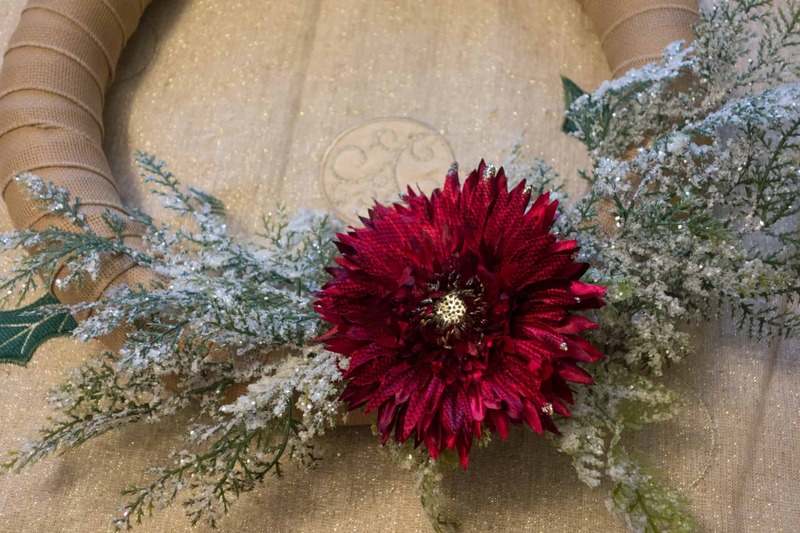 When I started messing around with the arrangement though, I decided to just use the frost covered branches. I loved the simplicity (and the sparkle 🙂 ) of this look. Again, I used my hot glue gun to glue each individual branch onto the wreath. For this particular wreath, I had two branches running upward, two running downward, and one little one to help fill in the middle section. 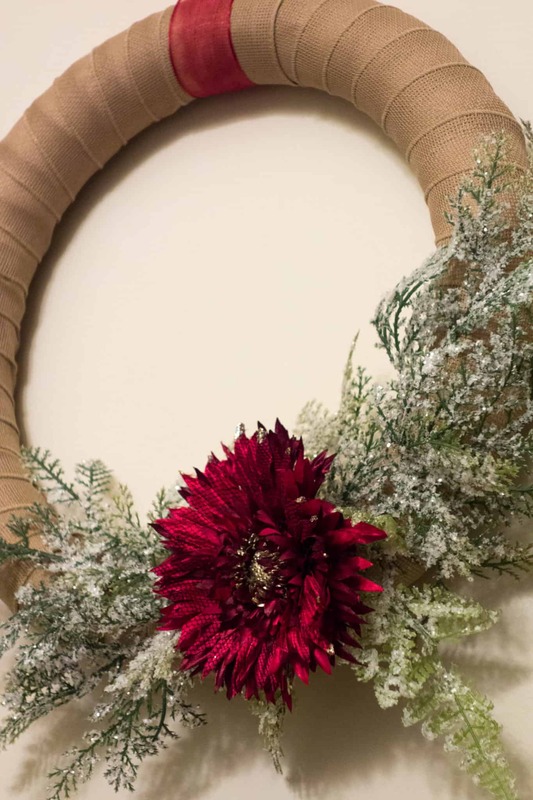 When all of the branches were secured to the wreath, I simply glued my accent flower right in the middle. At this point, I realized that the plaid ribbon I had purchased to hang it with was too wide and too stiff. Plus, it just wasn’t the final touch that I was looking for. So, after finding a more suitable (narrower, thinner) ribbon, I tied it up and hung it on the wall. 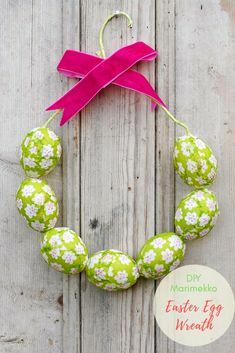 This wreath is really simple and beautiful. I love that it doesn’t take a ton of supplies. I can’t tell you how many times I have spent more on supplies then it would have cost to buy the item already done. I also think that it can work for other seasons just by changing out the greenery. Great idea. I love this! Really pretty. Doesn’t look too hard. I think I could handle it! It really was pretty easy! Trust me, if I could handle it, I’m sure you can too. 🙂 Thanks for looking! This turned out so cute, I love the greenery with the snow drops on them! I need to look for that! Thank you! I loved the sparkle of it. I’m pretty sure I got the greenery at Hobby Lobby. 🙂 Thanks for looking! 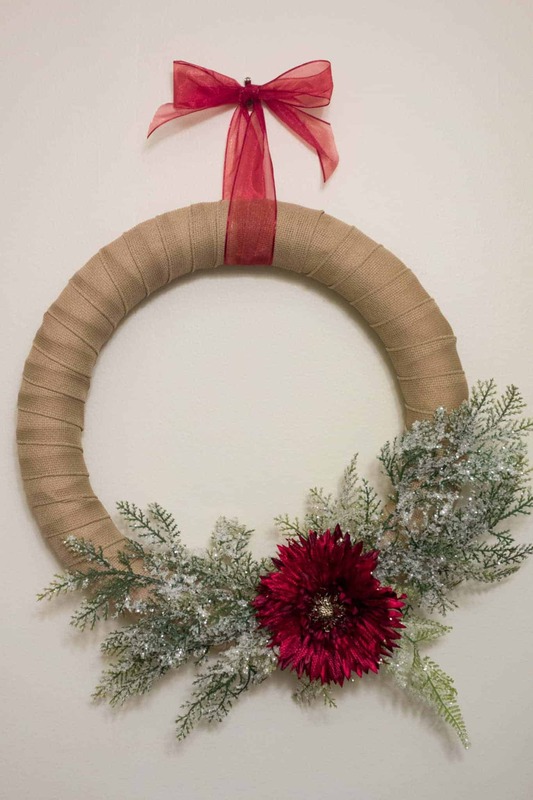 Your wreath is simple and beautiful. Pinned and shared. Thanks for the compliment, and thank you so much for sharing! Happy holidays! This is really beautiful -and so simple! thanks for sharing at the DIY Party! Thank you so much, and thanks for taking a look! Happy holidays! What a pretty wreath! I love the clean lines and the simplicity of the design. Very understated and very pretty. Thanks so much for sharing at the #happynowlinkup! Thank you so much! I loved the simplicity, as well, and it was just as simple to put together. Win-win! Thanks for looking! Love this! Simple and versatile 🙂 defintely pinning this and making one of my own! So glad you like it! 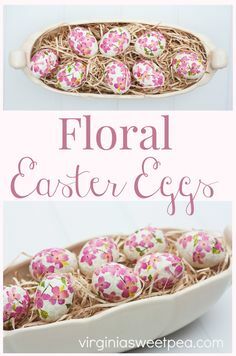 Thanks so much for taking a look and pinning! 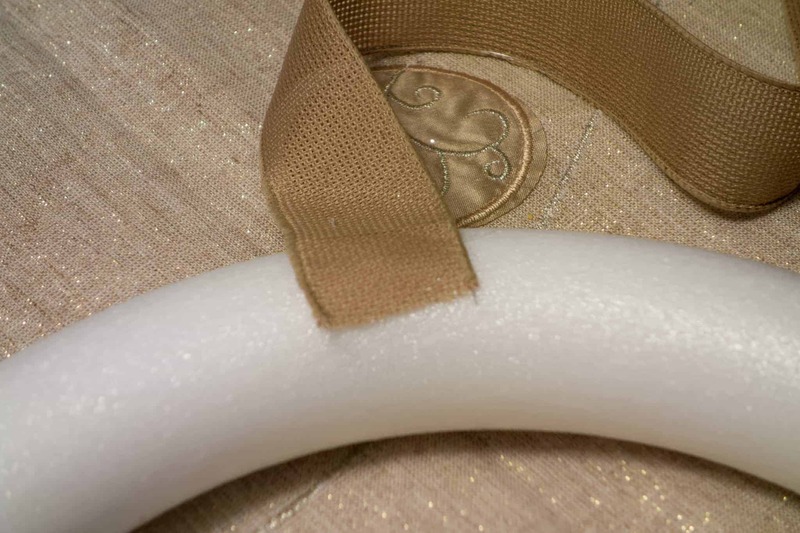 I love the natural look of the burlap ribbon! Don’t you love when people say “Steal Away”! Its such a fun type of permission! 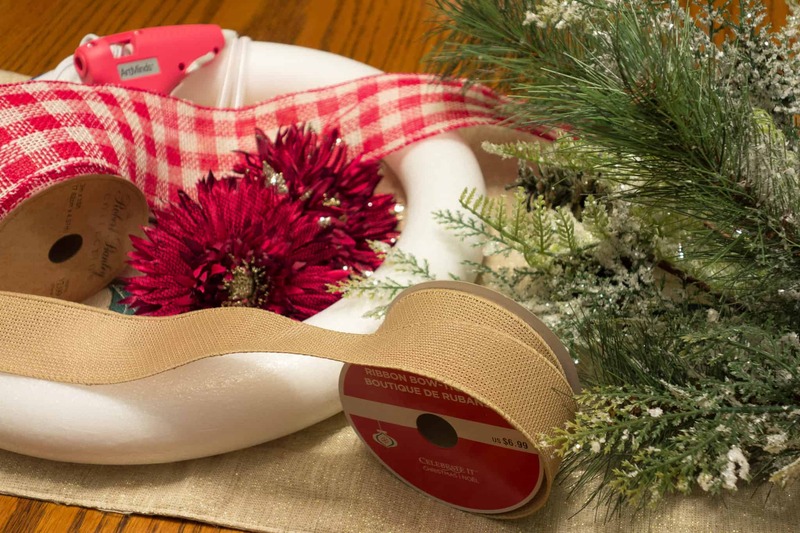 I love the ribbon you used—a touch of natural! Love it!